Mort Kunstler Handsigned and Numbered Limited Edition Giclee on Canvas:"Two, If by Sea"
About the Art: While Paul Revere rode, another signaling system that he and his compatriots had put in place began to function. During planning meetings a few days earlier, Revere had agreed "that if the British went out by Water, we would show two Lanthorns in the North Church Steeple; and if by Land, one, as a Signal; for we were apprehensive it would be difficult to Cross the Charles River, or git over Boston neck." 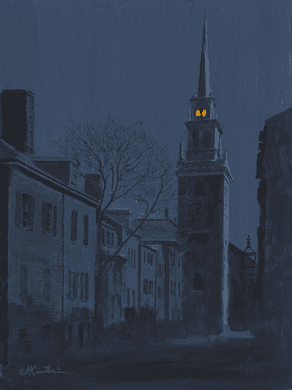 The Old North Church was one of the most venerable and visible structures in Boston, with a 191-foot steeple. The sexton, Robert Newman, was also an avid patriot; and as British troops left Boston and rowed to Cambridge he duly carried two lanterns up the church steeple. In truth, the signal - meant to warn patriots in Charlestown that the British were on their way - was unnecessary. It had only been intended as a backup plan in case a mounted messenger could not make it there with the information - which the messenger did. Necessary or not, however, the signal (thanks in part to the Longfellow poem) became one of the most iconic moments of the beginning of the Revolutionary War.